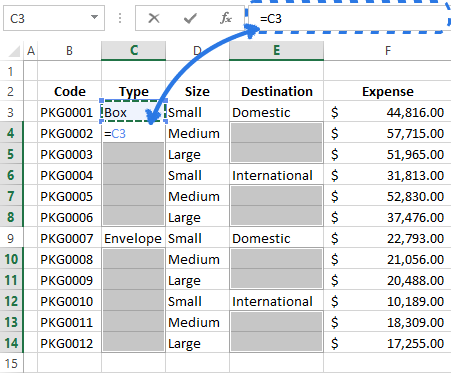 In this article you'll learn a trick to select all empty cells in an Excel spreadsheet at once and fill in blanks with value above / below, with zero or any other value. To fill or not to fill? This question often touches blank cells in Excel tables. On the one hand, your table looks neater and more readable when you don't clutter it up with repeating values. 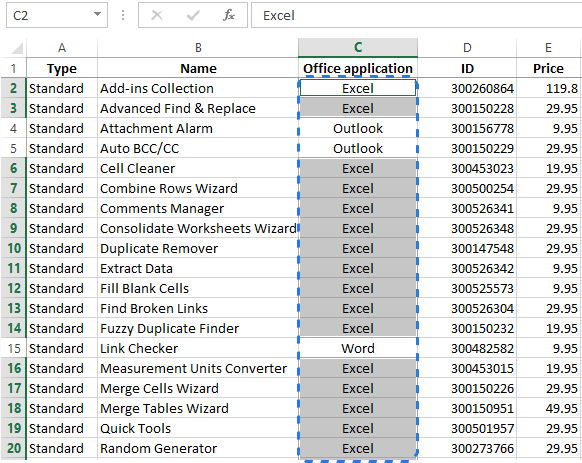 On the other hand, Excel empty cells can get you into trouble when you sort, filter the data or create a pivot table. In this case you need to fill in all the blanks. There are different methods to solve this problem. 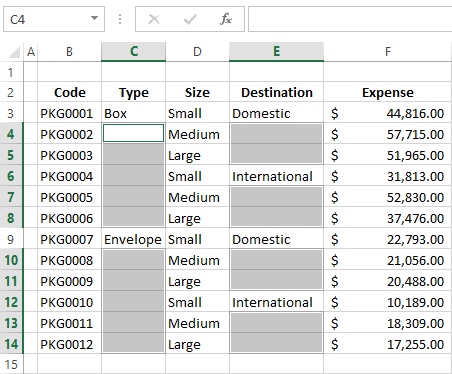 I will show you one quick and one VERY quick way to fill empty cells with different values in Excel 2010 and 2013. Thus my answer is "To Fill". And now let's see how to do it. Before filling in blanks in Excel, you need to select them. If you have a large table with dozens of blank blocks scattered throughout the table, it will take you ages to do it manually. Here is a quick trick for selecting empty cells. Pick the columns or rows where you want to fill in blanks. Press Ctrl + G or F5 to display the Go To dialog box. Click on the Special button. Note. If you happen to forget the keyboard shortcuts, go to the Editing group on the HOME tab and choose the Go To Special command from the Find & Select drop-down menu. The same dialog window will appear on the screen. 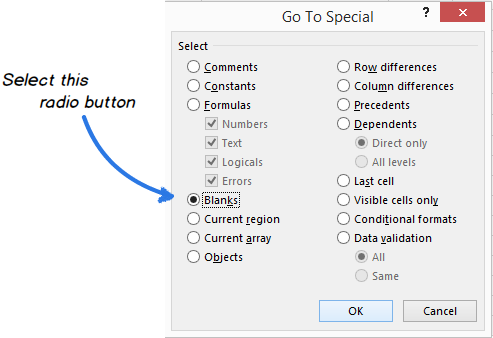 The Go To Special command allows you to select certain types of cells such as ones containing formulas, comments, constants, blanks and so on. Select the Blanks radio button and click OK.
Now only the empty cells from the selected range are highlighted and ready for the next step. After you select the empty cells in your table, you can fill them with the value from the cell above or below or insert specific content. If you're going to fill blanks with the value from the first populated cell above or below, you need to enter a very simple formula into one of the empty cells. Then just copy it across all other blank cells. Go ahead and read below how to do it. Leave all the unfilled cells selected. Press F2 or just place the cursor in the Formula bar to start entering the formula in the active cell. As you can see in the screenshot above, the active cell is C4. Enter the equal sign (=). Point to the cell above or below with the up or down arrow key or just click on it. The formula (=C3) shows that cell C4 will get the value from cell C3. 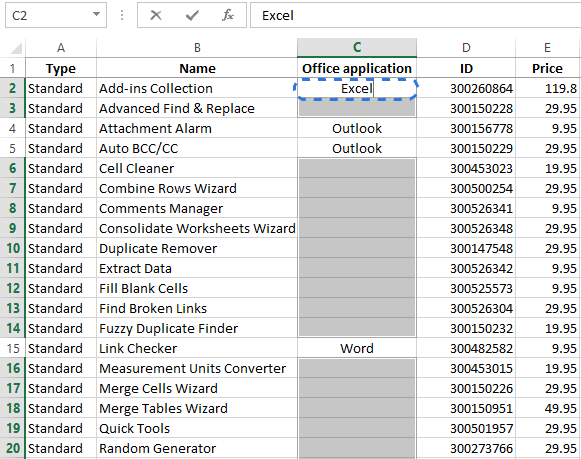 Press Ctrl + Enter to copy the formula to all the selected cells. Here you are! 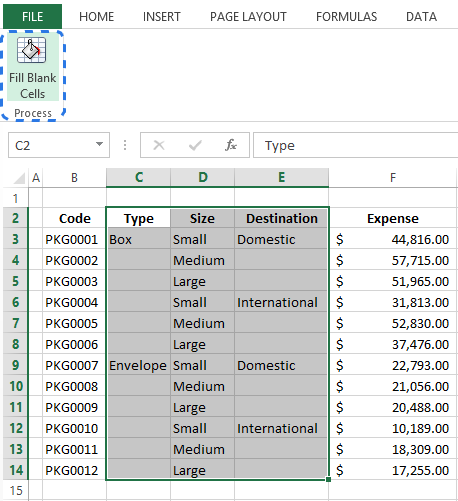 Now each selected cell has a reference to the cell over it. Note. You should remember that all cells that used to be blank contain formulas now. And if you want to keep your table in order, it's better to change these formulas to values. Otherwise, you'll end up with a mess while sorting or updating the table. 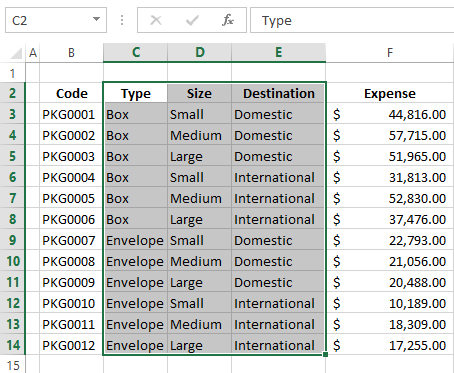 Read our previous blog post and find out two fastest ways to replace formulas in Excel cells with their values. 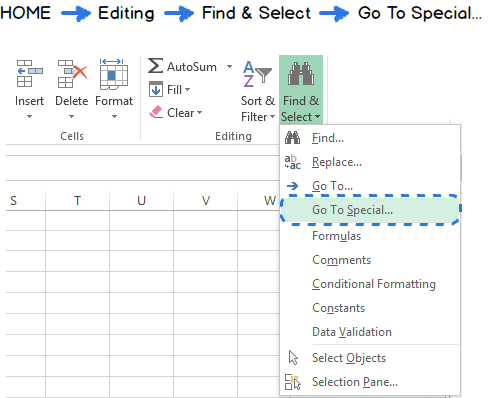 If you don't want to deal with formulas every time you fill in blanks with cell above or below, you can use a very helpful add-in for Excel created by Ablebits developers. The Fill Blank Cells utility automatically copies the value from the first populated cell downwards or upwards. Keep on reading and find out how it works. 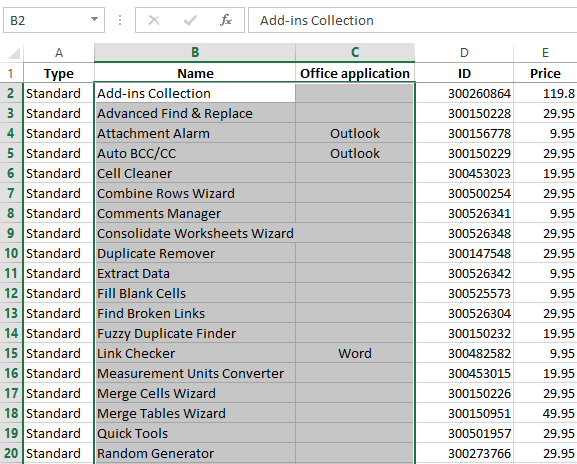 After the installation the new Ablebits Utilities tab appears in your Excel. Select the range in your table where you need to fill empty cells. Click the Fill Blank Cells icon on the Ablebits Utilities tab. The add-in window displays on the screen with all the selected columns checked. Uncheck the columns that don't have empty cells. Select the action from the drop-down list in the bottom-right corner of the window. 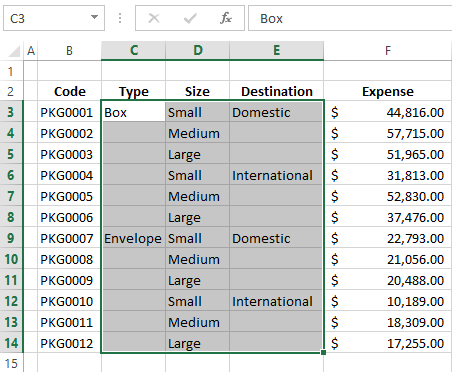 If you want to fill the blanks with the value from the cell above, choose the Fill cells downwards option. If you want to copy the content from the cell below, then select Fill cells upwards. Besides filling empty cells, this tool will also split merged cells if there are any in your worksheet and indicate table headers. Check it out! 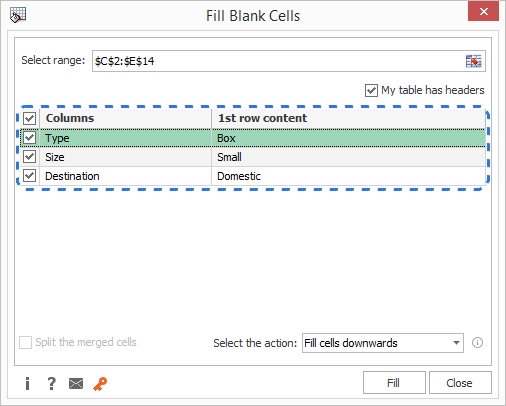 Download the fully-functional trial version of the Fill Blank Cells add-in and see how it can save you much time and effort. What if you need to fill all the blanks in your table with zero, or any other number or a specific text? Here are two ways to solve this problem. Press F2 to enter a value in the active cell. Type in the number or text you want. A few seconds and you have all the empty cells filled with the value you entered. Select the range with empty cells. Press Ctrl + H to display the Find & Replace dialog box. 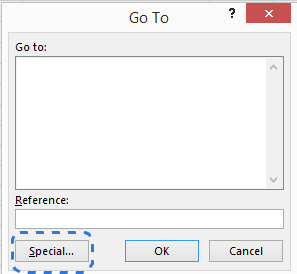 Move to the Replace tab in the dialog. Leave the Find what field blank and enter the necessary value in the Replace with text box. It will automatically fill in the blank cells with the value you entered in the Replace with text box. Whichever way you choose, it will take you a minute to complete your Excel table. 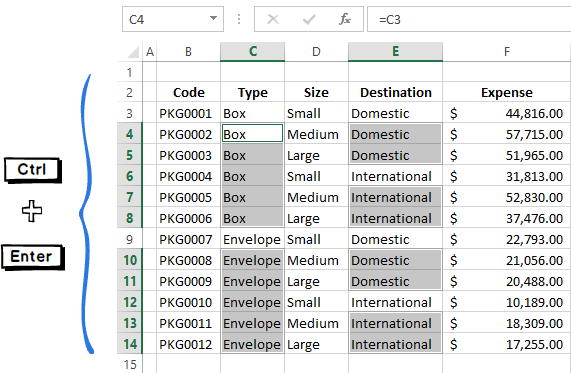 Now you know the tricks for filling in blanks with different values in Excel 2013. I am sure it will be no sweat for you to do it using a simple formula, Excel's Find & Replace feature or user-friendly Ablebits add-in. 87 Responses to "How to fill empty cells with 0, with value above/below in Excel"
You're goddess. Thank you very much! how can I fill the missing data of a row with the avarage of that row? When I do this method of the '=b2' it simply enters b2 all the way down. What did I do wrong? I know its a bit late after the fact but the issue is your column must be in 'text' format, same thing happened to me I changed it to 'General' and the above steps worked correctly. I press f2 on my mac when trying to replace the empty numbers with zeros and it only leads me to brighten my screen. Most likely you need to press the fn key at the same time, i.e. use the keyboard combination fn + F2. You don't know that you have saved my 3 days of work and I have done that work in 5 minutes. Great job man.. God bless you. Has anyone ran into the issues of hitting "crtl enter" and it doe not autofill the cells? I have ran this exact formula before but today it is not working? It looks like all the cells are not in the DATE format. Format the required cells/column/row as DATE and select the required format on the drop down menu. If leading zeros are required in the date, you can FORMAT CELLS>NUMBERS>CUSTOM, then input dd/mm/yyyy (or mm/dd/yyyy)under "Type:"
Excel formula to fill in blank cells with value above / below. Doing the steps referring with the value above is working. However, if I do the same with value below it is not working. Can anyone help? I want the below value to be copied on the above blank cells. I had around 70,000 rows and honestly this saved my time. Thank you so much. THANKS ALOT. YOU ARE GREATE . In 2017, and this article just saved me a lot of time. Big thanks ! Hello Thanks a lot for the great trick to fill in blank cells.. But unfortunately, for few set of data i dint get the blanks filled even after following same procedure.. It says "no cells were found". I have tried this on some other set of data and it works.. So i am confused. Both the data are numbers! Please help me find a way out. Thanks, easy instructions to follow - great help. Thanks Ablebits for this most valuable contribution and make our work-life easier!! I'm afraid there is no way to get the result you need using a formula. You'd better use a macro. I'm sorry, we can't help you with this, please try to find the solution in VBA sections on mrexcel.com or excelforum.com. Even in the 2010 and 2013 versions(this article written in 2014) the Get & Transform Add-In was available. Thankfully, it is now a native feature in 2016. You need to delete this article. This was a poor workaround back then. Stop using this program in the same ways you were back in 2003. You saved me a lot of time, Thank you so much! Thank you so much, you wont believe how complicated other sites have made this, I didnt even know there was such a simple way to do this. You've made my day! Thanks so much! Thanks. This information is very informative. Just to say thank you. Appreciated!! i tried this but it didn't work.. instead of filling with the above cell, I want it to fill with the below cell.. and the total number of blank cells in between is not the same.. does this only work when the blank cells in between is the same amount? I.e. for the example above, the blank cells under Box and Envelope is the same.. This made my life simple . enormous time is saved . You have saved me a lot of trouble. Thank you. Thanks for this...I have an issue though with line breaks. I have a spreadsheet of data that is filtered so for example, lines 10-15 might be hidden from my desired results - I want an 'N' in every cell from 8 down, but as cells 10-15 default to a '0', making everything after call 15 also a '0' - can page/line breaks be discounted? I would usually Ctrl,Shift and arrow down to highlight all blank cells I need an 'N' in but I have many breaks with the document being over 40000 lines big. This is a huge fix for me. It's something I've been struggling with for years, I am so happy I found this today!!! It's saving me hours of work. Amazing & Excellent, got the precise information, & helped me in working on MIS, Thank you.